That’s a shot from Sergei Eisenstein’s first feature film Strike. I went on a post-Christmas spending spending spree and bought a number of films from the Soviet era, along with some Kindle books as well as DT (dead tree) books. When I was in college Jim and Ted Pedas used to run the Circle theater on 21st and Penn NW in DC. This was a repertory house that played double and triple features of Hollywood classics and foreign films. Tickets were a dollar back in 1964, so it was a cheap date for a college student. Among the films that they showed were some of Eisenstein’s. 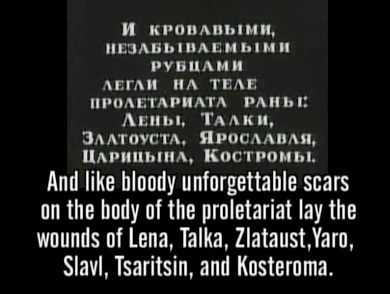 I remember seeing both parts of Ivan the Terrible there, as well as The Battleship Potemkin . I think that sometime after my first son, Zachary, was born I dragged my wife to see Alexander Nevsky. That has, as I recall, a fair amount of singing, and I said to her, “And you say I never take you to musicals.” I don’t recall her answer, but I don’t think she was amused. Strike is Eisenstein’s first feature, and centers around the build-up to a strike in Czarist Russian and its aftermath. Eisenstein. A micrometer is stolen from a plant, and a worker is told to pay 25 rubles, three weeks wages, to replace it. (1 ruble according to the rules of 1885 equals .774 grams of gold for a total of 19.35 grams of gold. About $1,000 at current prices.) The worker commits suicide because of the slander, and his fellow workers go on strike against the plant. Strike is a rhetorical film. That’s not to say that it has a lot of speeches, or even that it urges some action. It aims at persuasion. Now persuasion can be either towards a decision, which is more or less the area of judicial rhetoric; towards an action, which is the area of deliberative rhetoric; or towards praise and blame, which is the area of epideictic rhetoric. Eisenstein’s movie tends to be epideictic rhetoric. It blames the capitalist system for creating the conditions that lead to strike, and it praises the strikers for standing up to the bosses. Where it fails is best illustrated in the final intertitle. ￼ We’ve gone through an hour and a half movie, and all of sudden these names of individuals are dropped on us. We’ve never been introduced or come to feel for them. While Strike succeeds on the group level, it doesn’t move us to identify with or to feel for the individual workers who are slaughtered at the end. The Cigarette Girl of Masselprom. This is a romantic comedy from 1924. You didn’t know that Soviet cinema did rom-coms? Well, they did at least one. This is about a cigarette girl who is pursued by three men, an American, a cameraman, and an accountant. The accountant, or accounting assistant, is a student of romance languages. So even in Soviet Russia life was hard for students in the humanities, and they had to take jobs outside their fields of study. There is a funny scene about 13 minutes involving the accountant and cigarettes. Overall it’s a sweet, romantic, and very enjoyable romp. Give yourself a treat and buy it. Expect further updates here as I watch more of the movies. The Extraodrinary Adventures of Mr. West In the Land of the Bolsheviks (1924). Wikipedia credits this as the first anti-American film from the Soviet Union. I’m not so sure about that. It satirizes Americans, but I think it’s more a question of satirizing what the filmmakers felt was ignorance about the revolution rather than anti-Americanism as such. Mr West is the president of the YMCA, and he pays a visit to the Soviet Union. His wife tells him that the Bolsheviks are horrible, awful people, and shows him picture of typical Bolsheviks.The pictures characterize the Bolsheviks as vile, depraved creatures. She urges him to take Jeddy, his cowboy companion, along with him for protection. Upon their arrival they become separted, and Mr. West is taken in by crooks. Things go from bad to worse for our two heroes until they are ultimately saved by Bolshevik cops. Mr. West is shown a Socialist parade, which appears to be stock footage, and calls his wife and tells her to hang a picture of Lenin in his office. The film depicts Americans as being ignorant of the Soviet Union. Given the time and the difficulty of travel to Russia that was probably true. But it depicts Americans as being either rich guys or cowboys. So there is an unwitting portrait of the film makers’ own ignorance of America. There is also imitation of tropes and techniques that come over from American films, so there is a sense of envy and admiration for America too. Interestingly the film at the end, when Mr. West is viewing the parade, has a shot of Trotsky, soon to be forced from power, exiled, and assassinated. Mr. West’s greatest, but unexpressed, fears would come to a bitter fruition in the years after this film was made. Old and New (aka The General Line). This is one of Eisenstein’s silent films. It dates from 1929, five years after Mr. West, and it was started before the fall of Trotsky, interrupted by Eisenstein’s work on October, and finished after Trotsky’s fall. The political theme is rather mixed, but the plot, such as it is, has to do with the collectivization and industrialization of agriculture. The movie opens with two brothers quarreling and dividing their property. This includes cutting their poor house in two. The film shows the land moving from open land to narrow enclosed farms, and it pins rural poverty on the division of land. Eventually it is proposed that a collective farm be formed. One notable point here is the extended scene that shows the hold outs for the old ways, particularly the hold outs, the bitter clingers, for the old religion. Now Christians have a thing about shepherds. Jesus called himself the “good shepherd,” and his followers his flock. Now we tend to think of shepherding as a pleasant, idle occupation. The Greeks and Romans had a whole tradition of bucolic poetry. So we get all sentimental and weepy and “ahh that’s a cute, cuddly little lamb,” when we see scenes with sheep in them. Now the reality is that the sheep gets its fleece cut off, its milk stolen, and its flesh turned into chops. Sheep are also notoriously stupid. Eisenstein uses sheep in his imagery of the Christians who are praying. We see baaing, drooling sheep at their ugliest, and then we cut to the Christians. So he establishes his point that Christians are dumb sheep. There is some conflict over the collectivization process, including a poisoning which is blamed on the kulaks. Once the process is completed the farmers overrun the land that had been divided at the beginning of the film, and the natural order of things is restored. I can’t say that this is one of my favorite Eisenstein films. I think those would be Battleship Potemkin, and Ivan the Terrible I & II. It’s worth seeing, but it’s also worth keeping in mind that collectivization under Stalin led to the holdomor, the Ukrainian famine of the 1930s. * Three films that come to mind that use montage very effectively are: The Cruel Sea, Morgan, A Suitable Case For Treatment , and The Godfather . In The Cruel Sea there are two sequences, the first being the more memorable, in which rapid cutting between the crew of a ship, and the survivors of a British ship is used to establish horror as the ship and its crew are ordered to go in the path of the survivors, killing them, in order to target a German submarine. In Morgan there is rapid cutting that establishes the actual image of a person or object, and Morgan’s fantasy that relates the person or object to something out of Tarzan or King Kong. The cutting builds in tempo at the end to reflect Morgan’s final psychotic breakdown. In The Godfather the baptismal sequence at the end establishes a link between the evil that Michael is abjuring as he says the baptismal vows for his godson.